I assume you've read February’s book club pick, The Shadow of the Crescent Moon, the swift and suspenseful debut novel by Fatima Bhutto, so I'm not going to give a detailed plot summary. If you need one see here to find an outline from the UK publisher, Viking. I thought this novel wore lightly its challenging nature - but challenging it is. How could it not be, since it’s set in one of the world’s most challenging hotspots? Really? Sure, the Talibs might think they are fighting for justice, but how can that be divorced from their religious beliefs? I don’t know – one thing this book reinforced for me was my own ignorance of the political situation in Pakistan. There were many other nuances that I failed fully to understand, particularly around the people of Mir Ali’s bitter and entrenched loathing of the state, and their thoughts about Afghanistan. Still, that’s my fault, not Bhutto’s – she was not writing a political textbook, but a novel. So what about her characters? They too seemed to speak the secret language of us versus us, to distressing end, but with no clear-cut goodies and baddies, just differing degrees of complexity, compromise, and ability to negotiate between the demands of the self, and the demands of family and community. I thought Bhutto managed to balance the sympathies very evenly between Aman Erum, Samarra and Hayat. Likewise between Mina and Sikandar – I thought the portrait of Mina, a woman who had retreated into her own language, or else into the universal language of grief, incomprehensible to those not bereaved, was moving without being heartstrings-tugging. But that’s quite enough of what I thought. What did others think? The Shadow of the Crescent Moon was an enjoyable read, primarily because it gave me an insight into everyday life in Pakistan. Fatima Bhutto is Pakistani, and this authenticity shone through in her writing. I admire the fact that she did not shy away from including Urdu and tribal phrases, as these enabled me to gain a greater understanding of relevant South Asian culture. From a literary point of view, I liked the concept of following the journeys of three brothers, and the fact that the whole novel took place over the course of a single morning. However, I thought that the ending was slightly disappointing. I agree about the pace – the tight timeframe was one of the most compelling aspects of this novel – and also about the use of terms in local languages. I’ll come to my thoughts on the ending in a minute. A well-written and compelling book, drawing the reader into a painful and isolated way of life: "No one prays together, travels in pairs or eats out in groups. It is how they live now, alone." Says one of the main characters, Aman Erum, summing up the fear of the community, a fear which leaps out of the pages. The breakdown in family and other relationships is starkly and simply drawn. The depiction of the internecine fighting between the Shias and the Sunnis shows the sheer terror of being hated by other Muslims when you yourself are one, albeit of a different sect. Love and betrayal on a small scale and a large stage are at the heart of this very disturbing but very readable book, which I highly recommend, though I thought the ending tailed off. The Song of King Gesar is one of the world's great epics, as significant in Tibet as the Ramayana and Mahabarata in India. Set partly in ancient Tibet, where evil spirits meddle in the lives of humans, and partly in the modern day, The Song of King Gesar, by Alai (阿来), tells of two lives inextricably entwined. Gesar, the youngest and bravest of the gods, has been sent down to the human world to defeat the demons that plague the lives of ordinary people. Jigmed is a young shepherd, who is visited by dreams of Gesar, of gods and of ancient battles while he sleeps. So begins an epic journey for both of them. Gesar will become the warrior-king of Ling, and will unite the nation of Tibet under his reign. Jigmed will learn to see his troubled country with new eyes, and, as the storyteller chosen by the gods, he must face his own destiny. Alai was born in 1959 in the Sichuan province of Rgyalrong, of Tibetan descent. As well as critically acclaimed collections of poetry, short stories and essays, he has written a number of novels, including Red Poppies: A Novel of Tibet. Howard Goldblatt is the translator of Mo Yan (莫言). Together, he and Sylvia Li-chun Lin have rendered many contemporary Chinese-language novels into English. The Song of King Gesar should be widely available in Asia in hardback, priced in local currencies. It is also available as an eBook, available from on-line bookstores, and from the UK publisher, Canongate. Discussion of The Song of King Gesar will be posted on Sunday, March 30, so do please get in touch with your comments by then. Both The Shadow of the Crescent Moon and The Song of King Gesar are eligible for the ABB book of the Lunar Year in the Year of the Horse. See the post of Jan 30 2014 for details. If you would like to vote for either title please do so by posting a comment, or contacting asianbooksblog@gmail.com. Although you might have trouble finding print editions in Asia, I thought it was worth mentioning Pioneer Girl, by Bich Minh Nguyen, which is available as an eBook, through on-line bookstores and Penguin US. Bich Minh Nguyen is the Vietnamese-American author of Stealing Buddha’s Dinner. Pioneer Girl is a tale of mothers and daughters, lingering family secrets, and physical and metaphorical frontiers. Jobless with a PhD, Lee Lien returns home to her Chicago suburb from grad school, only to find herself contending with issues she’s evaded since college. 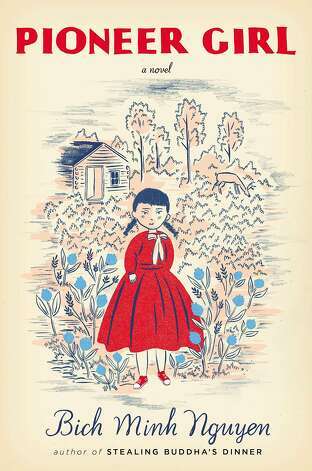 But when her brother disappears, he leaves behind an object from their mother’s Vietnam past: a gold-leaf brooch, abandoned by an American reporter in Saigon back in 1965, that might be an heirloom belonging to Laura Ingalls Wilder, the author of the Little House on the Prairie books, classics of American children's literature. As Lee investigates the history of the brooch, she unearths more than expected - a trail of clues and enticements that lead her from the dusty stacks of library archives to hilarious prairie life reenactments and ultimately to San Francisco, where her findings will transform strangers’ lives as well as her own. A literary mystery, Pioneer Girl is also the deeply moving tale of a second-generation Vietnamese daughter, the parents she struggles to honour, the missing brother she is expected to bring home - even as her discoveries yield dramatic insights that will free her to live her own life to its full potential.